A perfect opportunity to discover the beauty of Egypt in this 12-day trip enjoying Cairo, Nile Cruise and Hurghada Red Sea. A unique experience to see all of Egypt’s sights both Ancient and New. All airport transfers by private deluxe A/C vehicle. Domestic flight tickets from Hurghada to Cairo. Accommodation for 2 nights at a Cairo hotel on bed and buffet breakfast basis. Accommodation for 1 night aboard Sleeper Train on half board basis. All sightseeing tours in Cairo as mentioned are Private tours. Day tour to Pyramids, Sphinx, Valley Temple, Sakkara and Memphis. Day tour to Valley of the Kings, Hatshepsut Temple and Colossi of Memnon. Lunch meals during tours in Cairo and Giza. Notes: The Egyptian Railway Authority has designed and equipped sleeper trains quite comfortable according to Egyptian standards. They take about 14 hours from Cairo to Aswan. Nevertheless, if you do not enjoy long journeys, you can take an internal flight with an addition $ 85 per person. Upon your arrival at Cairo International Airport, you will be met by your Memphis Tours Representative who will accompany you to your hotel in Cairo for check-in and a free welcome drink. There you will be introduced to your Tour Manager for the trip, who will explain what to expect on your vacation to Egypt and will be your point of contact throughout the whole trip. He and will give you details of how to contact him at any time whilst in Egypt under the care of Memphis Tours. Throughout your Cairo Nile Cruise Red Sea holiday, in addition to the Tour Manager, you will meet a variety of English-speaking Tour Guides, who have been chosen for their expertise on each of the areas you are visiting. After check-in, you are free to spend the rest of the day / evening at your leisure. There is a wonderful opportunity to do an optional excursion to the Sound & Light Show on Giza Plateau, by the magnificent Pyramids. Pick you up from your hotel in Luxor by air-conditioned mini bus to Luxor Airport for your flight to Cairo, where you will be accompanied by your personal Egyptologist Tour Guide visiting Sakkara that is part of Memphis's massive Necropolis, and the burial site of the most ancient Pharaohs where you will see the first Pyramids build in Egypt, the Step Pyramid of King Djoser that was designed by Imhotep, the ancient Egyptian architect. Also a visit to the Teti Pyramid and Tombs in Sakkara then you will be transferred to Memphis, the ancient Capital of Egypt to visit the colossal statue of Ramses II and nearby a still half-buried Hathor Temple then drive to the famous Giza Plateau, home of Egypt’s signature attractions of the Great Pyramids, one of the Seven Wonders of the Ancient World including the Great Pyramid of Cheops, Middle Pyramids of Chephren and the smallest Pyramid of Mykerinos along with the mysterious Sphinx, the Father of Terror for the ancient Pharaohs. The tour includes a visit to the Valley Temple facing the great Sphinx. After Giza, you will be transferred back to your hotel for a peaceful overnight stay in Cairo. Please note* There is an additional charge for entering inside the Pyramids and also the Solar Boat Museum. Please speak with your tour guide should you wish to purchase a ticket to enter one of these sites. An optional evening tour to attend the fabulous Sound and Light Show at the Pyramids is available or you may wish to enjoy an evening on a luxurious Nile cruise ship for dinner, belly dance and oriental show for 2 hours then you will be transferred back to your hotel. Breakfast in your hotel in Cairo. Leisurely free time in Cairo followed by a tour to the world-renowned Museum of Egyptian Antiquities that was built in neo-classical style designed by the French architect Marcel Dourgnon which exhibits a collection now over 120000 masterpieces ranges from pre-dynastic era, Pharaonic era to the Greco-Roman period in Egypt. Afterwards enjoy an afternoon of shopping at the Khan El Khalili famous Bazaar and old market in Cairo and barter for some local handmade treasures. This full day ends with dinner during an overnight trip to Aswan by a sleeper train (Private Compartment). Please note* There is an additional charge for the Mummies Room at the Museum of Antiquities. Please speak with your tour guide should you wish to purchase a ticket to enter one of these sites. You will be met at Aswan Train Station, then transferred to your Hotel with a full day ahead to Enjoy Aswan.We recommend the optional tour to Abu Simbel, the second top tourist attraction after the Pyramids in Egypt. Abu Simbel Temples were originally carved out of the mountainside during the reign of Pharaoh Ramesses II in the 13th century BC, as a lasting monument to himself and his queen Nefertari. Overnight in Aswan. NB: Incase you would like to do Abu Simbel Tour so you will do it on day 5 and Aswan sightseeing tours will be on day 4. 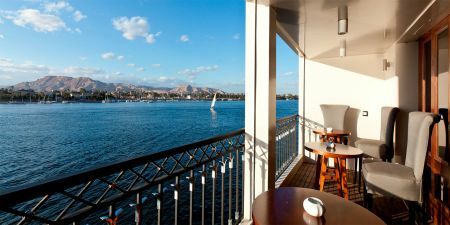 Enjoy breakfast at your hotel in Aswan with free time at leisure at your Hotel. You will be met at your Hotel in Aswan by Memphis Tours representative, who will accompany you to your Nile cruise ship in Aswan for embarkation and a free welcome drink and lunch. You will begin by visiting the Aswan High Dam which was built in the 1960’s to provide the much-needed electricity and irrigation for the country. Nubia, the area that was flooded, experienced the biggest and most thorough archaeological excavations that Egypt has ever known. Then we go to see the ‘Unfinished Obelisk’ which still lay in the granite quarries which provided ancient Egypt with building materials. It would have been the largest piece of stone ever handled but when a crack was discovered it was abandoned where it was being hewn. Cross by boat to Angilika Island, to see the Temple of Isis at Philae which is one of the Nubian Temples rescued before the High Dam was built. Enjoy Philae’s long colonnades, towers and reliefs which include the last surviving hieroglyphic and demotic inscriptions in Egypt. Then you will be transferred to your Nile cruise ship in Aswan for dinner, free time at leisure and overnight stay. After enjoying breakfast on board your cruise ship in Aswan you sail to see the unique Temple of Kom Ombo. Of all the ancient Temples in Egypt, this is the only one which is divided into two, to reflecting it’s dedication to two Gods Sobek, the Crocodile God of fertility and the falcon-headed Horus, God of the sky. Kom Ombo is also famous for the depictions of surgeon's instruments, giving us an early record of medicine and surgery in Ancient Egypt. In the afternoon you visit the huge Ptolemaic Temple of Horus at Edfu, which is the most complete and best preserved of the Egyptian Temples, consisting of many columns, halls, chambers and chapels. Two statues of Horus flank the twin-towered entrance gate and inside, one of the interesting inscriptions lists the titles of books (scrolls) held in the library. The rest of the day is spent at leisure and overnight on board. Relax while watching daily life on the banks of the Nile as you sail to Luxor. En route you will pass through the lock at Esna, where you are likely to be entertained by the local traders trying to sell their wares from rowing boats. During the cruise, you will learn more about the art and architecture of Ancient Egypt as well as the mysteries of the Pharaohs and their fascinating culture. At Luxor with your Guide, you will visit Karnak Temple, which is the world's largest ancient religious site. The hypostyle hall with its colossal granite columns is one of Egypt’s famous landmarks. There will be free time to explore the different parts of the huge complex built during the reigns of various Pharaohs. Then you will be transferred to the majestic Luxor Temple which built by Amenhotep III and Ramses II for ritual and festivals and dedicated to the God Amun and you may wish to take advantage at night, of the optional evening ‘Sound and Light Show’ which tells the story of Luxor and Karnak. ( Highly recommended). After enjoying a leisurely breakfast on board the Nile cruise boat, your expert Tour Guide will take you on a fascinating Nile journey to the West Bank of the River Nile to experience the original resting place of the world famous boy King Tutankhamun in the Valley of the Kings along with discovering the Temple of Queen Hatshepsut (the only Female Pharaoh) at El Deir EL Bahari and the two towering statues of the Colossi of Memnon. (The three tombs visited are determined by the Egyptian Government as to preserve them from the large flow of visitors, therefore are rotated throughout the year and cannot be confirmed as to which tombs prior to your visit). For the rest of the day you will have free time to spend at leisure in Luxor to experience the traditional culture of the Upper Egyptians before transferring to Hurghada (approximately 4 hours drive), the exciting resort destination, located on the pristine beautiful Red Sea, check into the hotel with free time at leisure and overnight stay. Breakfast at the Hotel, and then in the morning you will be met by our Representative in the Hotel lobby and transferred to the jetty to board the boat for a fantastic snorkelling trip on the Red Sea with time to also relax on a small desert island. Lunch will be served on board the boat with mineral water, soft drinks, coffee and tea and then you will return to the jetty, where you will be met by our Representative, who will transfer you back to the Hotel. The balance of the afternoon is at leisure. Free evening time for nightlife, including shows, bars and restaurants. After breakfast, enjoy a half day at leisure to explore the many splendid activities of the sparkling Red Sea and enjoy the sun and sea at your beach resort. Afternoon time you will be taken for a wonderful Bedouin Safari trip in Hurghada to know about Bedouins life and tradition, with a camel ride into the Hurghada desert and enjoy amazing sunset views with barbeque dinner and Bedouin show and folkloric dance. Later you will be transferred back to your Hotel for an overnight stay in Hurghada. After breakfast, your day at leisure to relax, swim soak up the sun or take another optional evening excursion to attend the amazing Arabian Night to 'Alf Leila We Leila' 1001 Nights that is a highlight for most visitors to Hurghada. A fantastic experience to see the local customs and traditions of Egypt, with belly dancers, horse show and Sound and Light Show at AlF Leila Wa Leila with sounds and lighting re-enacting the history and stories of the Great Pyramids, Karnak Temple and Abu Simbel. The Sound and Light Show is followed by a Pharaonic horse show where acrobatics on horseback and general horsemanship is displayed. The third and final show is an oriental belly dancer and Tanura, Dervishes Dance at the end of the evening you will be transferred back to your Hurghada Hotel. After breakfast, you will be met by our Representative, who will transfer you to Hurghada Airport for the flight to Cairo International Airport where you will take your flight back home.